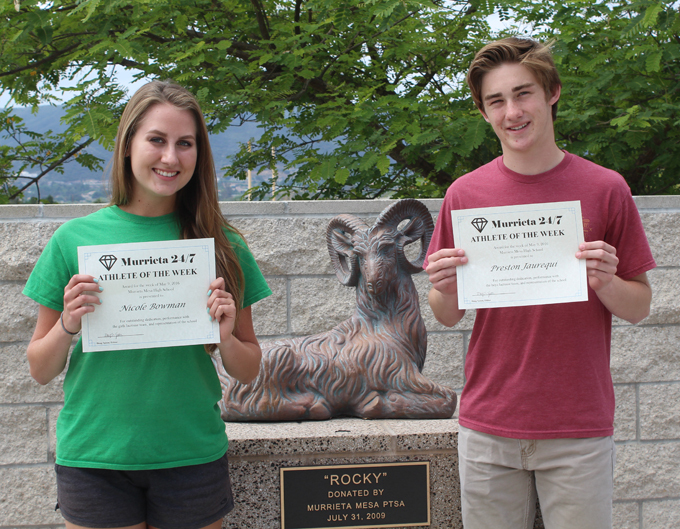 Lacrosse players Nicole Bowman and Preston Jaurequi are the Murrieta Mesa Athletes of the Week. Preston Jaurequi has excelled for the boys lacrosse team, despite being just a sophomore. "Preston has been a leader on defense all season long," said his coach, Charles Arthur. "We moved him to attack, where he had 10 goals and 4 assists in our last six games." Nicole Bowman has been a standout this season for the girls lacrosse team, which is 14-6 overall.